One of the things I've always loved about summer are the plentiful grassy fields of those white dandelion flowers. While sitting at Logan's summer league baseball game we discovered huge patches of these flowers. I asked Lizzie if she'd ever made a daisy chain before and she said no. 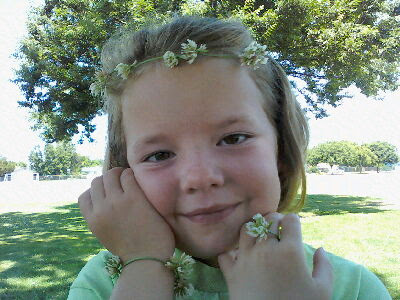 How did my girl come this far in life without ever experiencing a homemade flower necklace?! We promptly set to work and made her a beautiful jewelry set. Tiara, bracelet and ring. It only took a few minutes to teach Lizzie how to make these gorgeous accessories. She got to hear "when I was a little girl..." stories while we linked the flowers together. By the time we were finished she felt like a beautiful flower fairy princess. Thank you lazy summer days for these lovely mother/daughter moments.